The 2011 Mississippi River flood in the Lower Mississippi River Basin was one of the largest flood events in recorded history, producing the largest or next to largest peak streamflow for the period of record at a number of streamgages on the lower Mississippi River. Ecosystem effects include changes to wetlands, nutrient transport, and land accretion and sediment deposition changes. Direct effects to the wetland ecosystems in the Lower Mississippi River Basin were minimized because of the expansive levee system built to pass floodwaters. Nutrients carried by the Mississippi River affect water quality in the Lower Mississippi River Basin. During 2011, nutrient fluxes in the lower Mississippi River were about average. Generally, nutrient delivery of the Mississippi and Atchafalaya Rivers contributes to the size of the hypoxic zone in the Gulf of Mexico. Based on available limited post-flood satellite imagery, some land expansion in both the Wax Lake and Atchafalaya River Deltas was observed. A wetland sediment survey completed in June 2011 indicated that recent sediment deposits were relatively thicker in the Atchafalaya and Mississippi River (Birdsfoot) Delta marshes compared to marshes farther from these rivers. 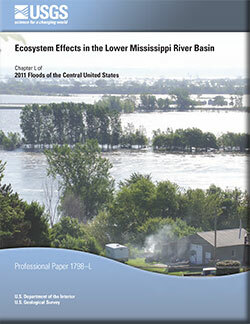 Turnipseed, D.P., Allen, Y.C., Couvillion, B.R., McKee, K.L., and Vervaeke, W.C., 2014, Ecosystem effects in the Lower Mississippi River Basin: U.S. Geological Survey Professional Paper 1798–L, 17 p., http://dx.doi.org/10.3133/pp1798L.